Haunted House Fundraiser: On Saturday, Oct. 24 the SMU Global Medical Brigades welcomes you to attend their annual Haunted House Fundraising event. The Haunted House will be held on the McElvaney Lawn, 6000 Bishop Boulevard, between 8 – 11 p.m. All profits will go toward medications and flight expenses for their members to travel to rural Panama and medically treat underserved villages. The Great Crumpkin: On Sunday, Oct. 25 Crum Commons will host a Halloween/Fall inspired Music and Film Festival featuring live music, pumpkin carving, free food, photo booth and film competition. Come to the Crum/Armstrong Quad between 3:45 – 11 p.m. to join in on the fun! Visit the event page for more information. A Spooktacular Showing: Kathy Crow and Loyd Commons are hosting a Spooktacular Showing of the classic Halloween movie, Hocus Pocus! The event will also feature pumpkin carving, fall food, and FREE shirts for the first 175 guests. The feature presentation will be on Wednesday, Oct. 28 on the lawn in front of Kathy Crow Commons. The movie will start around 8 p.m. – feel free to bring a towel or blanket to sit on! S’mores and More with Pulse: Come enjoy a warm fire, delicious S’mores and make new friends on Thursday Oct. 29 from 7 – 9 p.m. outside Armstrong Commons, 5809 Bush Ave.
SMU students and alumni took time for their community as part of the Peruna Paint Project at Dallas’ Lee A. McShan Elementary School on Saturday, April 11, 2015. The ongoing project – in which University community members paint colorful murals using SMU themes – was created to encourage local elementary- and secondary-school students to think about college and to inspire them toward future opportunities. 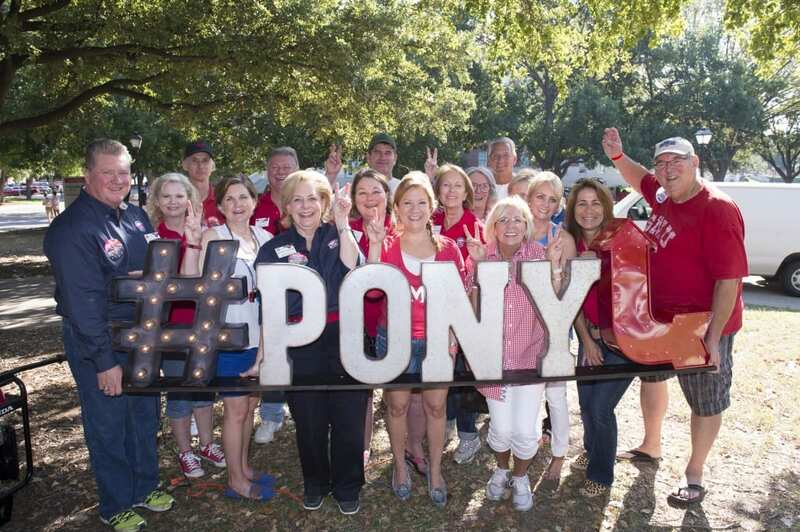 Click the YouTube screen to watch the Mustang Minute video by Myles Taylor of SMU News, or visit this link to watch the Peruna Paint Project in a new window. Men’s Basketball: Nic Moore has been named to the Associated Press All-American Honorable Mention list. Moore, The American Athletic Conference Player of the Year led the Mustangs in scoring (14.5) assists (5.1) and steals (1.3) as SMU captured its first regular season conference championship in 22 years. Women’s Equestrian: Eighth-seed SMU will face ninth-seed Kansas State in the opening round of the 2015 National Collegiate Equestrian Association Championship on Thursday, April 16, at the Extract Events Center in Waco, Texas. Men’s Football: The SMU football team returns to Ford Stadium for the 2015 Spring Game & Mustang Fan Fair on Saturday, April 18 at 1 p.m. Introducing the Chad Morris era on the Hilltop, the game will give fans a glimpse into #PonyUpTempo football. In addition to the action on the field, the stadium will have bouncy houses, food trucks, faceprinting and a photo booth. For more information, visit the event webpage. Men’s Golf: The Mustangs closed the Mason Rudolph Championship in seventh place behind a 2-under 69 from junior Ryan Burgess on Sunday, April 5, at the Vanderbilt Legends Club. Next, SMU will visit Columbus, Ohio for the Robert Kepler Invitational for a two-day tournament beginning on Saturday, April 11. Women’s Golf: After carding their lowest team score (one-under 287), the SMU women’s golf team jumped two spots up the leaderboard for a 4th-place finish at the Anuenue Spring Classic on Wednesday, March 25, in Kapalua, Hawaii. The Mustangs shot 14-over (878:299, 292, 287) in the 54-hole event for their fourth top-five finish this season. Next, the Mustangs will have a two-week hiatus before hosting their only tournament of the season. The two-day DAC/SMU Invitational begins on Friday, April 10, at the Dallas Athletic Club. Women’s Rowing: Coming away with the win over Kansas in 1st Varsity 8+ action, the SMU women’s rowing team hosted a three-team event on White Rock Lake on Saturday, April 4. The Mustangs finished in 7:37.5, outpacing Kansas, which clocked a 7:44.4 in the race. Next, the Mustangs host Tulsa for the annual Lawless Cup on Saturday, April 18. Lissi Lonsberry tallied two goals in the win. Men’s Soccer: Former SMU men’s soccer standout Damian Rosales recently signed a professional contract with Arizona United SC, the USL affiliate of FC Dallas. Rosales played 71 matches for the Mustangs between 2011 and 2014. To follow Rosales’ season, visit the club’s webpage. Women’s Soccer: With junior Lissi Lonsberry scoring a pair of goals, the SMU women’s soccer team defeated Texas Women’s University, 3-0, on Wednesday, April 1, at Westcott Field. Next, the Mustangs host Stephen F. Austin on Saturday, April 11, at 1 p.m. at Westcott Field. Men’s Swimming & Diving: After earning All-American honors in the three-meter, senior diver Devin Burnett placed 21st in the platform competition at the NCAA Championship at the University of Iowa’s Campus Recreation & Wellness Center on Saturday, March 28. Burnett is SMU’s first All-American diver since Matthew Culbertson in 2009. Women’s Swimming & Diving: SMU senior Isabella Arcila posted the second fastest time in school history in the 100-yard freestyle during the NCAA Swimming and Diving Competition at the Greensboro Aquatic Center. While the Mustangs’ 2014-15 team schedule comes to a close with the completion of the Championship, select individuals will compete at the Mesa Grand Prix on April 15-18. Men’s Tennis: The SMU men’s tennis team fell to American Athletic conference foe and 22nd-ranked USF, 4-3, on Friday, April 3, at Turpin Stadium in the Brookshire Family Pavilion, SMU Tennis Complex. Next, the Mustangs host crosstown rival and 10th-ranked TCU on Wednesday, April 8 at 6 p.m. at the SMU Tennis Complex. Women’s Tennis: The SMU women’s tennis team fell to American Athletic Conference foe Memphis, 4-0, on Friday, April 3, at the Racquet Club of Memphis. Next, the Mustangs remain on the road for another conference matchup against rival Houston on Wednesday, April 8, at 11 a.m.
Women’s Track: Five SMU distance runners competed in the Stanford Invitational on Friday, April 3, at Stanford University’s Cobb Track. Setting a new top mark in the American Athletic Conference this season, Holly Archer led the Mustangs with a fifth-place finish in her 1,500-meter heat (4:26.29). Next, the Mustangs will compete in the Mt. SAC Invitational April 16-18.